Charoite is a very useful stone for teachers, leaders and speakers. It aids the communication of wisdom and truth. 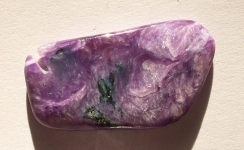 Charoite helps one to project an aura of authority and confidence. It increases one's perception of beauty and refinement.